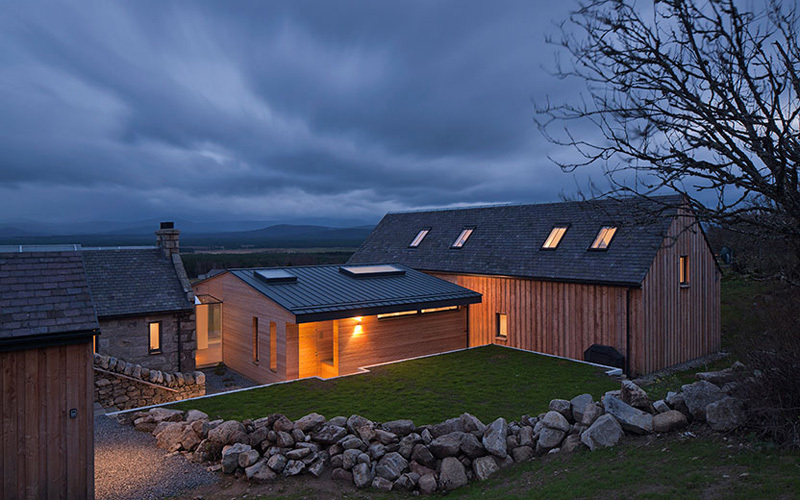 Architects Stuart Archer and Liz Marinko, have designed Torispardon, a home in the Central Highlands of Scotland, that was once a derelict cottage and steading (farm buildings). 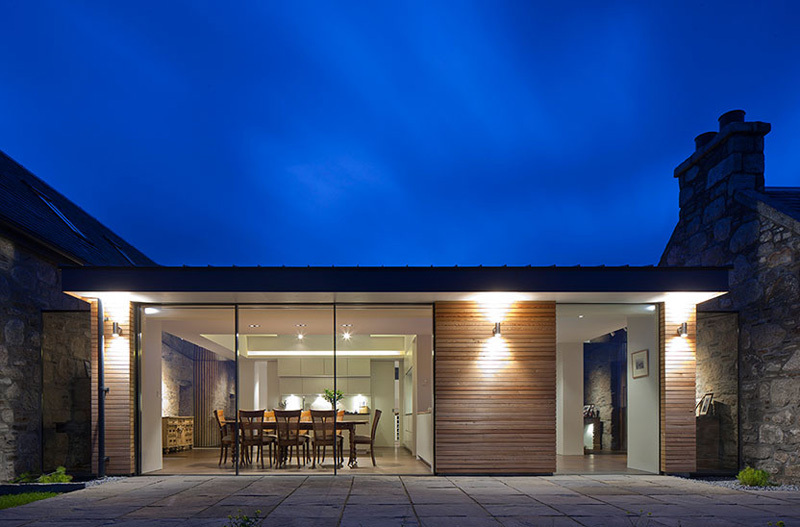 The Client, who is Scottish and had been living down in the south of England for 30 years, bought the plot of land in the Central Highlands in 2008 with the intention of one day building a home to relocate to. 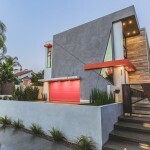 Her son, the Architect, had the opportunity to move to the area and oversee the project. The existing buildings were part of an old croft consisting of a derelict Cottage and Steading. Due to the state of disrepair it was decided to rebuild these two structures maintaining their massing and footprint. Early on in the design process it was decided to introduce a third contemporary structure, the Link, and join the 3 buildings together with glass. Torispardon – ‘Tor’ in Gaelic means a rock or pile of rocks atop a hill. 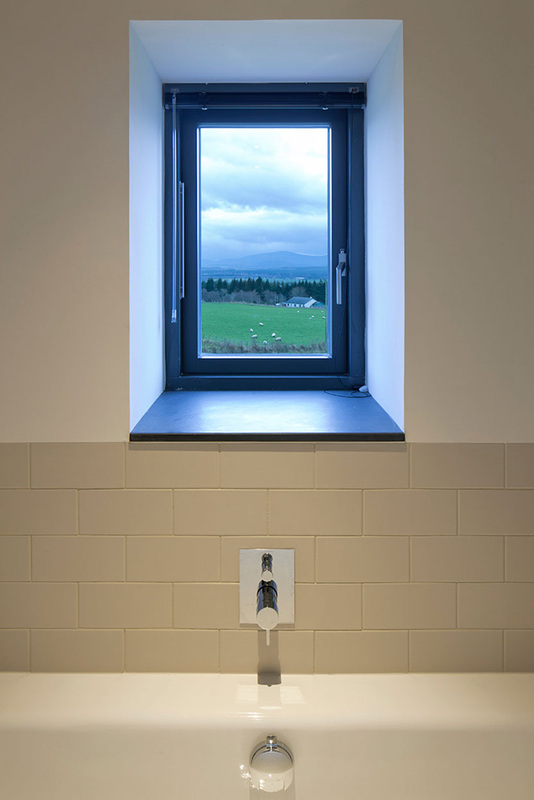 The site is on a hillside in the Spey Valley and has panoramic views of the Cairngorm Mountain range. The area is predominantly agricultural, and from this came the inspiration for how best to approach the site. Farmer’s crofts in the Highlands often have several outbuildings within their boundaries; as a farm expands or requires new facilities, a new outbuilding is constructed. Instead of creating a new singular house it was felt that this additive approach was more appropriate. 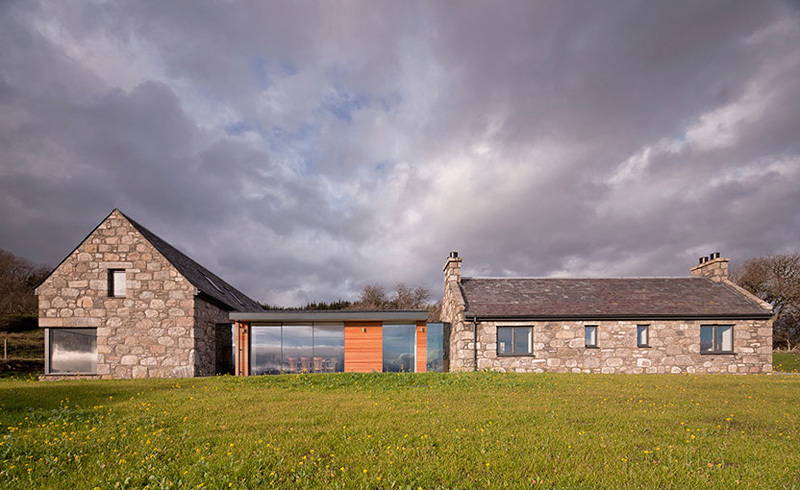 To nestle the new buildings into their context, the Steading is sunk partially in the ground, cutting into the land behind as it rises – the Link also has a retaining wall to the rea of it to emphasize the same effect. 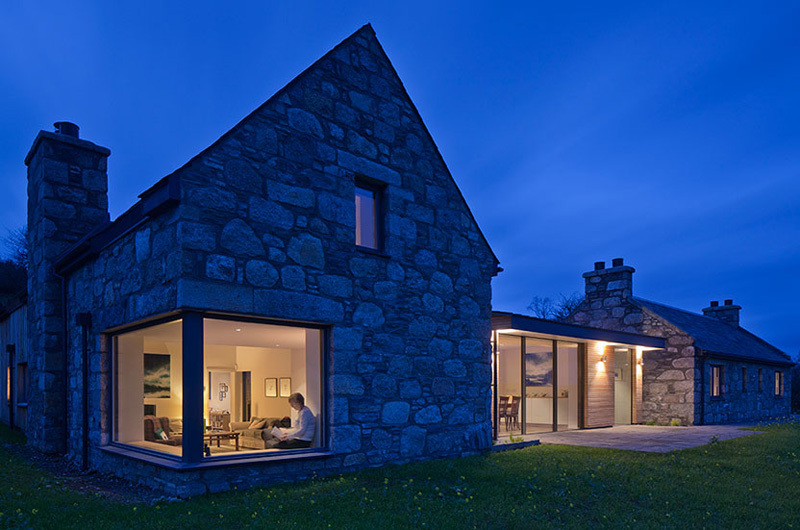 The landscaping was kept to a minimum, where utilised it was carefully considered – by retaining the existing levels, using local flora and any unused stone from the construction – the new buildings in the existing site blend naturally into the surrounding fields. The project falls in the boundaries of the Cairngorm National Park, a local conservation authority. Whilst the Architecture of this project doesn’t play to this, it knowingly respects it’s context. 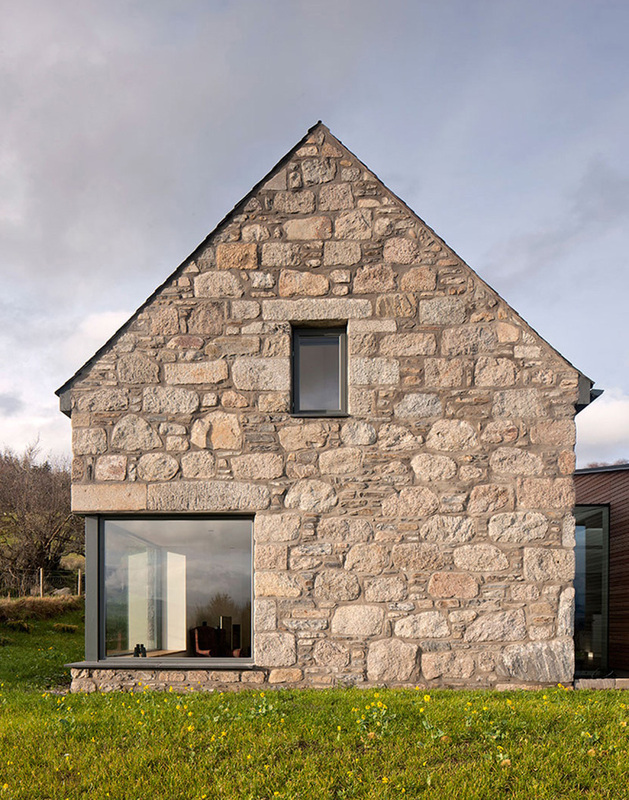 The Cottage and Steading reference the traditional local stone vernacular, whilst the Link building is contemporary in form yet deliberately subservient to the other structures. Frameless glass elements tie the buildings together physically, whilst allowing the 3 structures to remain visually separate. The accommodation is designed around the requirements of the Client. The building needed to be flexible in accommodating differing numbers of people throughout the year. For periods of time the house would just be occupied by the Client herself, but had to be big enough to accommodate family and friends when necessary. It was important that the spaces felt generous but not overwhelmingly so. 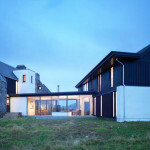 The solution to this was using the Cottage element as a guest facility that could be ‘shut off’ when not required, and locating the Client’s master bedroom and ancillary spaces within the Steading. The entrance is to the rear of the property via the Link. 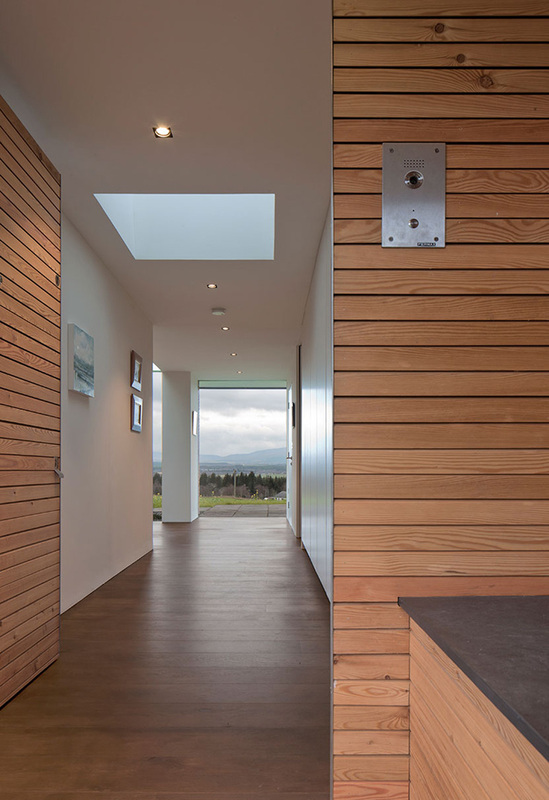 Upon opening the front door there is a large floor to ceiling frameless picture window giving a glimpse of the mountains beyond. The Link, taking inspiration again from agricultural forms, employs a steel portal frame structure which enable large unimpeded spans that minimise the need for columns. 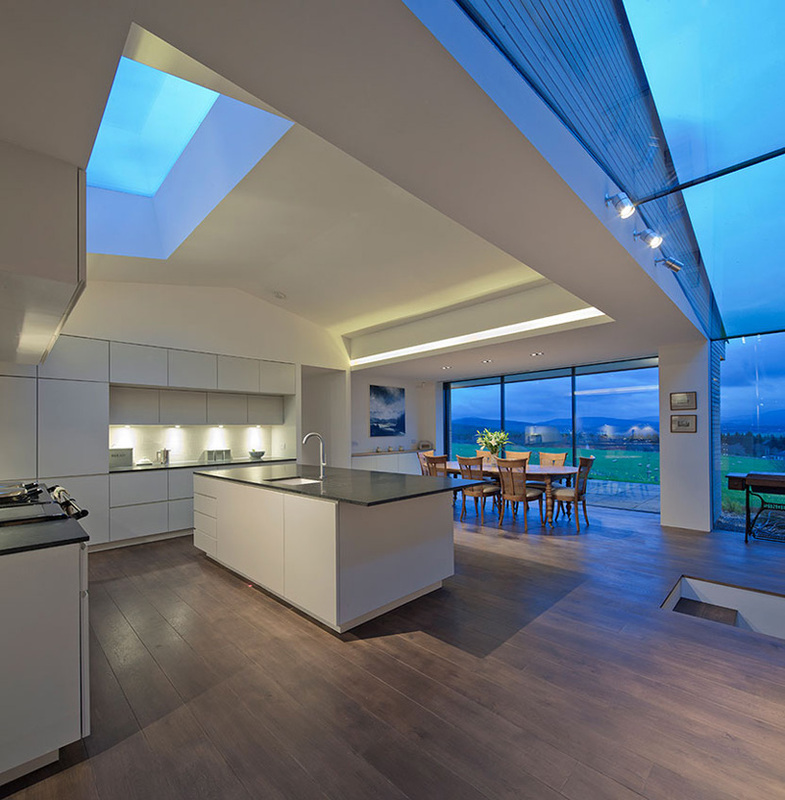 The large modern kitchen with dining space are located here, with a utility and boot room that can be closed off to the rear. 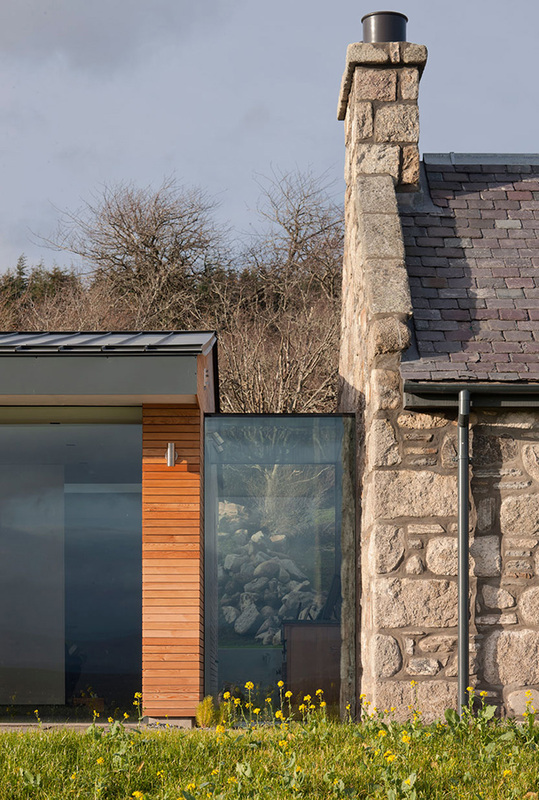 To both sides of the Link, frameless glass walkways let both the Cottage and Steading stone walls cut through the space, allowing the stone walls to seamlessly change from external to internal walls. 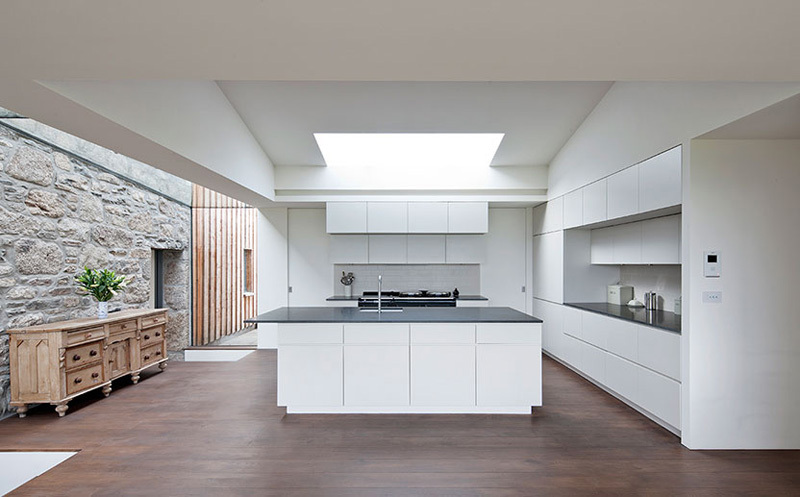 The contrast of the traditional materials with the light modern interior is a key design feature. 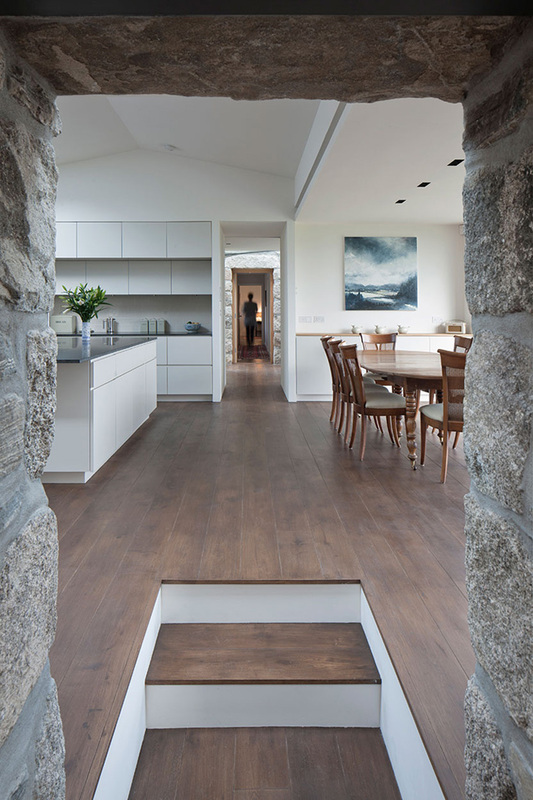 From the Link, there are a few steps down into the Steading which reveals a double height living space with vaulted roof, sunk slightly into the ground. The sitting area has a large corner window with deep oak reveals that allow guests to sit and look over the landscape beyond. 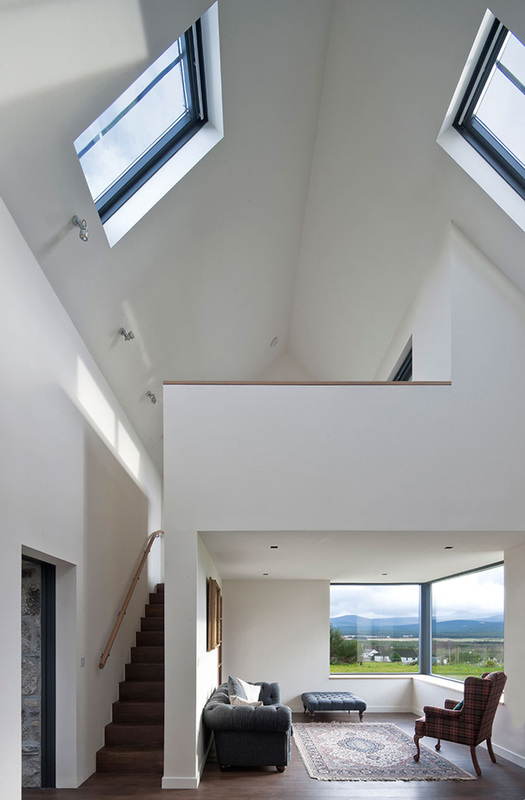 A staircase leads to a mezzanine snug at 1stfloor with access to a stone clad balcony. To the rear of the Steading there is the master bedroom with dressing, ensuite and 1st floor study with balcony.